Leading Light produced a tenacious performance to land this afternoon’s Group Three Queens Vase at Royal Ascot, which was run this year in memory of the late Sir Henry Cecil. The three-year-old was tackling the two-mile trip for the first time and was always prominent despite his jockey Joseph O’Brien having to work hard at him on occasions. However, the 5/4 favourite stayed on stoutly in the final couple of furlongs to record a length-and-a-half victory despite the persistent threat of the eventual runner-up Feel Like Dancing. Trainer Aidan O’Brien admitted he had no idea whether his colt would stay the two-mile distance but felt his style of racing would suit a test such as this. “We felt that the step up in trip might suit him but you never know as he’d only raced over a mile-and-a-quarter before,” said O’Brien. “Joseph had only ridden him twice before so the partnership is relatively new and his pedigree gave us mixed messages as well as he is out of a Queen Mary winner (Dance Parade, who won the race in 1996 for trainer Paul Cole). “He coped with it well enough though and all credit has to go to the lads as they were the ones who came up with this plan. “He could make up into a St Leger horse I suppose but he’s not short of speed and maybe a mile-and-a-half could be his trip in time. “The St Leger is a possibility as is the race in France on Bastille Day (the Grand Prix de Paris at Longchamp) so there are plenty of options for him. 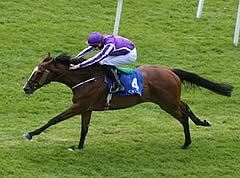 Jockey Joseph O’Brien also revealed that he had reservations as to whether Leading Light would stay the trip. “We were a little bit worried about the trip but other than that we thought Leading Light was a very nice horse and he’s toughed it out,” said O’Brien. “He is very relaxed and has a great attitude. He is very hardy and when you get stuck into him he finds plenty. He is idle and when he gets to the front, he stops. Aidan O’Brien was also keen to pay tribute to Sir Henry Cecil, in whose memory this race was run. “Sir Henry was the most incredibly special man. I remember when we started training, horses used to come to us from the sales cast and things like that, but there was never any point trying to improve a horse from Sir Henry because they always went backwards,” said O’Brien. “We will never see another man like him in my lifetime. He got everything out of his horses and was a lovely man to meet at the races. I remember the last time I saw him when his voice was not that good – I said: ‘hello Sir Henry,’ and I thought he didn’t see me but he had a stick in his hand and as he walked by me I felt the stick on the back of my legs. Stepping up in trip proved no problem for Feel Like Dancing, although the winner, Leading Light, held too many aces. After Lady Bamford’s horse had finished second in this Group Three, two-mile test for three-year-olds, trainer John Gosden said: “It was a good run and I’m very pleased with him. He had a tough job given that he was five wide coming into the home straight, but he finished nicely. Peter Chapple-Hyam was no less pleased with third-placed Boite. The Newmarket trainer said: “I said in today’s paper I thought this horse would run well. The second horse [Feel Like Dancing] beat us at Newbury and I knew he wasn’t a bad horse.